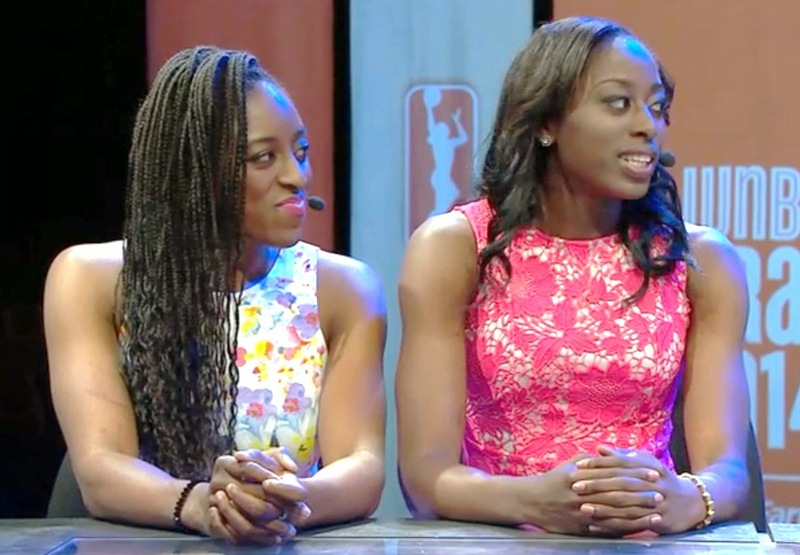 Stanford star Chiney Ogwumike became the top overall pick in the WNBA draft Monday, two years after sister Nneka Ogwumike was taken first by the Los Angeles Sparks. The Connecticut Sun grabbed the 6-foot-3 Chiney with the first selection in Uncasville, Conn., as the Ogwumike sisters joined Payton and Eli Manning as the only siblings to become No. 1 picks in American major pro sports. But the younger Ogwumike didn't expect it to happen, revealing a new side of one of the greatest players in Stanford history. "I didn't have confidence, but Nneka said, 'I told you so,' " Ogwumike said shortly after the selection. "She always has confidence." The three-time All-American never seemed to lack confidence while taking the leadership role after Nneka Ogwumike graduated in 2012. Chiney Ogwumike left Stanford as the Pac-12's all-time leading scorer and rebounder, passing former Cardinal stars Candice Wiggins and Kayla Pedersen in those categories this season. The Texan led Stanford (33-4) to the women's Final Four, where it fell to eventual champion Connecticut in the semifinals in Nashville, Tenn.
"I still think people have more confidence in me than I do in myself," Ogwumike said. "That's one thing I worked with my coaches at Stanford. But it's pretty cool to feel that way." Now she will be expected to expand her game with so many strong forwards in the WNBA. Connecticut coach Anne Donovan recently said Ogwumike will have to develop a midrange shot to be effective. "Now I have no other choice," Ogwumike said. "Before I knew I could stay in my comfort zone. You grow when you get outside of your comfort zone. Now it is time for me to keep working and just show it." Ogwumike, who Friday won the John R. Wooden award as college player of the year, knows developing a perimeter game is the path to her ultimate goal: winning an Olympic gold medal with her sister. "Striving for that goal has made us better players," Ogwumike said. Stanford coach Tara VanDerveer told the forward, "You're going to have to get outside the block to make the Olympics." Ogwumike became the 11th Stanford player to earn a first-round pick in the WNBA draft -- the sixth in seven years. She is one of 22 Cardinal players to get drafted into the league that opens the 2014 season next month. Ogwumike also kept alive a remarkable tradition. She is the fourth Stanford athlete from the Houston area to become a No. 1 pick in the past three years. Quarterback Andrew Luck joined Nneka Ogwumike as 2012 top picks while pitcher Mark Appel had the distinction last year. The Tulsa Shock took Baylor guard Odyssey Sims second while the San Antonio Stars got Notre Dame guard Kayla McBride at No. 3. Maryland's Alyssa Thomas went fourth to the New York Liberty, while Florida State's Natasha Howard went to Indiana to round out the top five. The Sun also took Hayward native Chelsea Gray of Duke at No. 11. The Chicago Sky took Cal's Gennifer Brandon at No. 22. The Seattle Storm used the 31st pick to take Stanford's Mikaela Ruef, who Monday night sounded giddy. "It was so surreal, it was crazy," she said. "I don't care it was almost the last pick. I'm so thankful. I can't even believe this." The fifth-year senior, who got her master's degree in engineering this year, didn't expect to get drafted. But her outstanding play that led the Cardinal in the Final Four caught the scouts' attention. "I knew since I played well in the tournament there was a chance," the 6-3 Ruef said. Brandon, Cal's all-time leading rebounder, is a 6-2 forward known for her jumping and rebounding ability. She was the No. 22 overall pick despite missing part of her senior season for personal reasons. She returned to the court at the start of Pac-12 play, averaging 8.2 points and 8.5 rebounds to help the Bears reach the second round of the NCAA tournament. Brandon was watching the draft with some Cal teammates when Reshanda Gray noticed her teammate's name pop up on the TV. "I was speechless," Brandon said. "I was at a loss for words. It was a wonderful feeling." Brandon is the second WNBA draft pick out of Cal in the past two years and fourth overall. Last April, guard Layshia Clarendon was the ninth overall pick by the Indiana Fever. Brandon said she didn't go into draft day with any expectations about where she'd be drafted or if she'd even be drafted at all. "Any team that chose me I was going to be thankful for regardless," Brandon said. "Numbers don't mean anything as long as I hear my name." Brandon plans to finish up her degree in American Studies before heading to training camp with the Sky. DeNesha Stallworth, who began her college career at Cal before transferring to Kentucky after her sophomore season, was also drafted. Stallworth, a 6-3 forward and Pinole Valley High graduate, was the first pick of the third round at No. 25 overall by the Sun.